' Los Sueños' in Spanish means ' The Dreams' and if there were ever a home so appropriately named this is the one! Los Sueños is a great example of the kind of vacation rental that you would find located at the Four Seasons Resort on the Peninsula de Papagayo. There is one difference, Los Sueños is available for a fraction of the costs of those homes where typical rental rates are $2500 and up PER NIGHT! 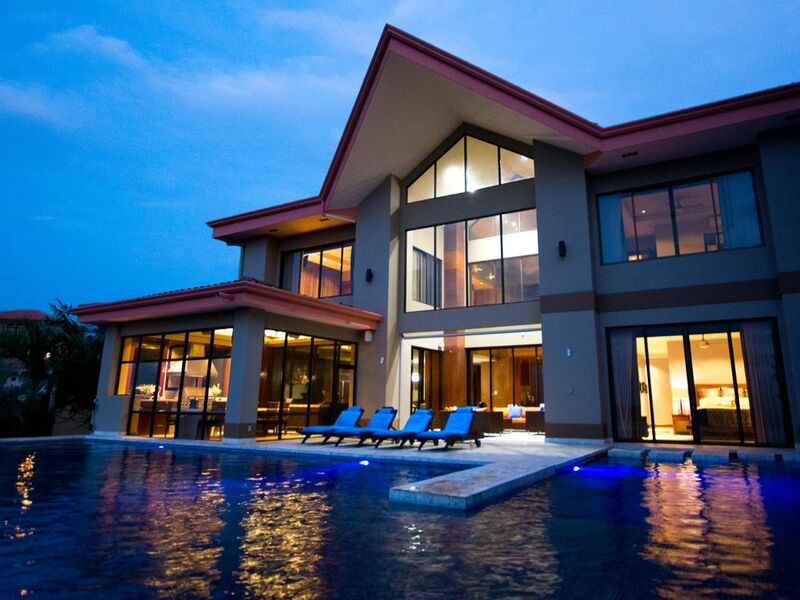 Elegant, Luxurious are common terms often used to describe rental properties in Costa Rica. Some actually do define those terms but very few exceed them. Los Sueños viewed from its decor, location or amenities simply leaves others in her dust. The views of the Gulf of Papagayo will take your breath away. The decoration, the cooking facilities, the bedroom suites leave nothing else to be desired. With 5 luxury bedrooms you and your companions will be surrounded with every amenity that you could have placed on your ' wish list'. • Huge unique pool with waterfalls. Casa de los Sueños really shines when it comes to outdoor living. You can enjoy the wonderful weather Costa Rica has to offer in comfort and style. A separate screened in outdoor kitchen/dining room is a comfortable place to cook and enjoy meals while staring a gorgeous ocean views. The ' List' goes on and on but no picture, no words can truly match the awe inspiring experience of stepping into this amazing home. Come and experience it for yourself. We promise that Los Suenos is indeed the vacation home of your dreams. Located in the exclusive Monte Paraiso community in Playa Hermosa. Safe, gate with 24 hour security, beautiful foliage throughout and the utmost amazing views of the Papagayo Peninsula. A gourmets delight! Indoor and outdoor kitchen La cucina con vista! Incredible home, perfect for large groups, pool and outside areas are beautiful! We spent 10 days here with our adult children and grandchildren, could not have stayed in a more beautiful home! Great Property in a Nice Location!!!! We recently spent 8 days in Villa Los Suenos and had a great time. The location overlooking the Gulf of Papagayo is first rate and the property is fantastic. We had a party of 8 and the home worked out perfectly. The separate grill area was perfect for grilling dinner while enjoying the views. The pool was fabulous and a great hit with our party. There are some markets in the local vicinity where you can get all the groceries you need and be totally self sufficient if you prefer to not to go out to eat, but there are also some great restaurants in the local area that I would recommend. If you have a large party and are looking to stay in the Playa Hermosa area, I would highly recommend the property. Great House with a View!! We stayed here for a family vacation for 7 adults and 1 child. There was plenty of room, the house is gorgeous and the views are breathtaking. We took advantage of the outdoor living area with pool and enclosed grill. The staff was very accommodating and responsive. If you're looking for a top notch luxury house, this is it !!! This property has everything you want in a luxury home and more. The outdoor kitchen is awesome and the outdoor living space made for a wonderful vacation. It is everything that is promised!! Highly recommend this. This home is fantastic. It has a state of the art kitchen and living space. The beds are comfortable. The pool is spectacular with an amazing view. Definitley recommend it. This house is wonderful. It was perfect for our group. The home has all the bells and whistles and then some. The top of the line kitchen (indoor and outdoor) was awesome. The screened living space was very nice. The pool is great with a breathtaking view. Highly recommend this property for your vacation. Please contact owner for rates. 50% deposit required at time of booking Balance due 30 days prior to arrival No refund available for cancellations within 30 days of arrival. Cancellations: A voucher, good for 18 months will be issued to those renters that have made full payment PRIOR to original arrival date Cancellations prior to the 30 days MAY receive a partial refund subject to re-rental.